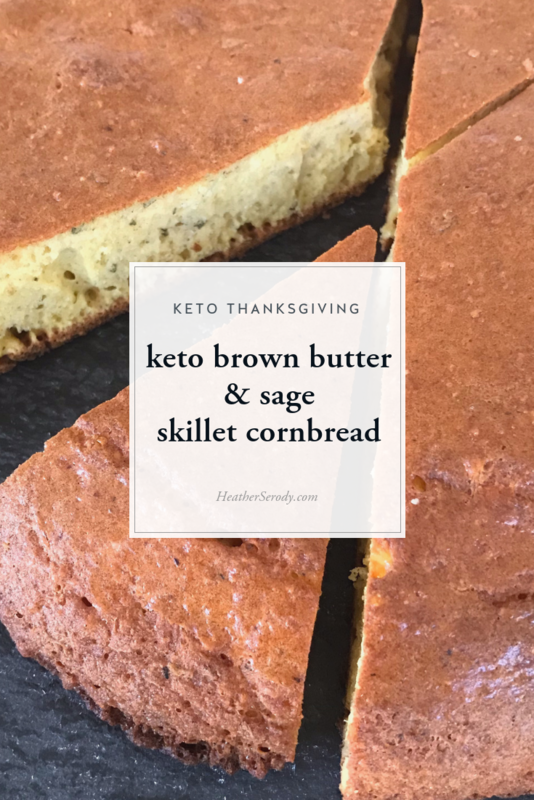 I developed this recipe to become the base for my pecan sage & sausage cornbread stuffing for my Keto Thanksgiving meal plan. But, it turned out so yummy that it's great on its own or to process finely into breadcrumbs, too. This recipe will make one round cornbread loaf baked in a 9″cast iron skillet that can be cut into 8 pie-shaped slices. This is a great approximation to traditional cornbread, and it has a lovely corn flavor and lots of nice air pockets for texture but it doesn't pretend to taste exactly the same. If you want the exact regular taste of carby cornbread, then you should totally make some. 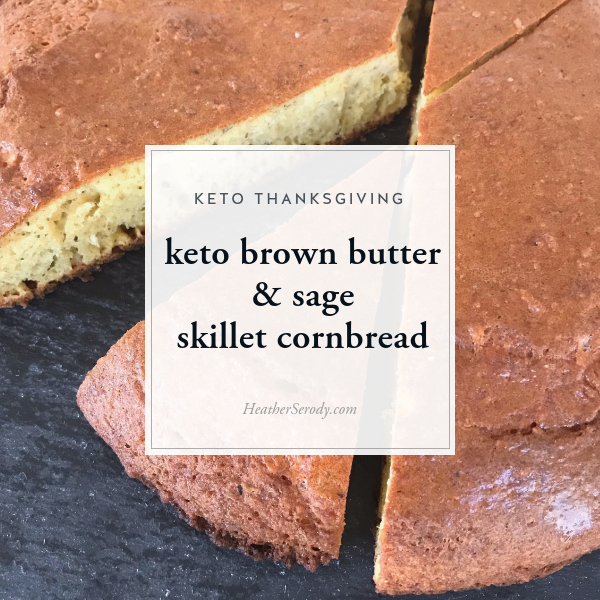 For the rest of us, this keto copycat recipe is a nice substitute when keeping carbs low is a priority. For each slice of my keto cornbread, you save a whopping 49 grams of carbohydrate per slice as compared to regular cornbread! Amoretti brand sweet corn flavoring is a super concentrated flavoring extract that really does bring the sweet corn flavor of summer back to keto cooking without all of the carbs. It's pricey, but keep in mind that you use very little because it's concentrated, so you'll be using it for a long time. heads up – order these ahead of time! 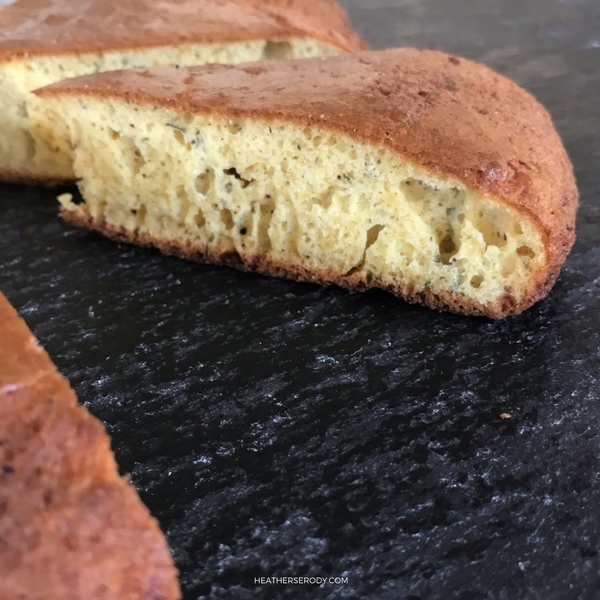 Using Amoretti sweet corn extract & unflavored egg white protein powder is crucial to turning out a yummy keto cornbread, so be sure to order the corn extract, a 9″cast iron skillet and protein powder well in advance of making this recipe! Every ketonian should have a 9″ cast iron pan because you'll use it to make this cornbread, yummy Dutch baby dessert & breakfast recipes, and your daily eggs & bacon on the regular. You can get a pre-seasoned Lodge skillet for about $15 that will last you a lifetime. If you are making this recipe as a base for my pecan, sage & sausage cornbread Thanksgiving stuffing, but you prefer white bread stuffing over cornbread, then just omit the Amoretti sweet corn extract. Optional: 1 tsp. liquid stevia Stevia simple syrup, or stevia glycerate ONLY IF you prefer your cornbread sweet. Otherwise, omit. Preheat oven to 400ºF. Place 9" cast iron or ovenproof skillet in the oven to preheat. In a medium bowl combine pork rinds, parmesan, protein powder, baking powder, salt, & sage; mixing with a whisk until well combined. In a separate large bowl, add sour cream, eggs, corn extract, vinegar, & optional sweetener & whisk until well combined. Ad the dry ingredients to the wet ingredients and mix with a spatula until well combined. Remove the hot cast iron pan from the oven & set on the burner. Add butter; swirling it around up the sides of the pan & cook until the milk solids bubble and the foam & butter browns. Pour off about 2 TBS of the browned butter into the cornbread batter & give it a quick stir to incorporate. Quickly pour the cornbread batter into the buttered skillet & spread it out to the edges of the skillet with a spatula. Return the skillet to the oven for approximately 18 minutes, or until cornbread is puffed, browned, the cornbread has pulled away from the sides of the pan, & a toothpick inserted into the center comes out clean. Cool in the pan for 15 minutes. Remove & cut into 8 pie wedges. Serve immediately.